Many childhood illnesses are on the rise, and a growing body of scientific evidence links pesticide exposure to this troubling trend. Using facts and findings from the current body of evidence, I hope you’ll join me in taking a stand for kid’s health! When it comes to pesticides, children are among the most vulnerable. Pound for pound, they drink 2.5 times more water, eat 3-4 times more food, and breathe 2 times more air. They therefore absorb a higher concentration of pesticides than adults. Infants and children also face unique exposure because of how they interact with the world: they crawl on the ground and put things in their mouths — including their hands. They also face exposure during critical windows in the womb and via breast milk. Since they are growing so quickly, infants and young children are more susceptible to the effects of pesticide exposure than adults. Their developing brains and bodies are in the midst of complex and fragile developmental processes that regulate tissue growth and organ development — and these developmental processes can be irreversibly derailed by pesticide exposure. 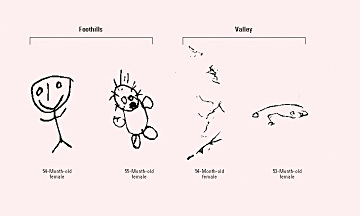 Drawings by preschoolers exposed to pesticides (Valley) compared to those by preschoolers not exposed (Foothills). See “Developmental Delay” below. Many of the worst pesticides, known as “persistent organic pollutants,” or POPs, contaminate our water and soil for years. They move on the wind and in streams, rivers and oceans and concentrate as they move up the food chain. Other pesticides are so widely and heavily used that they contamine our food and water supplies (chlorpyrifos and atrazine are good examples). So, while farmer and farmworker’s children bear some of the highest risks, pesticides contaminate the environment and permeate the food supply such that even kids in city cafeterias face daily exposure.